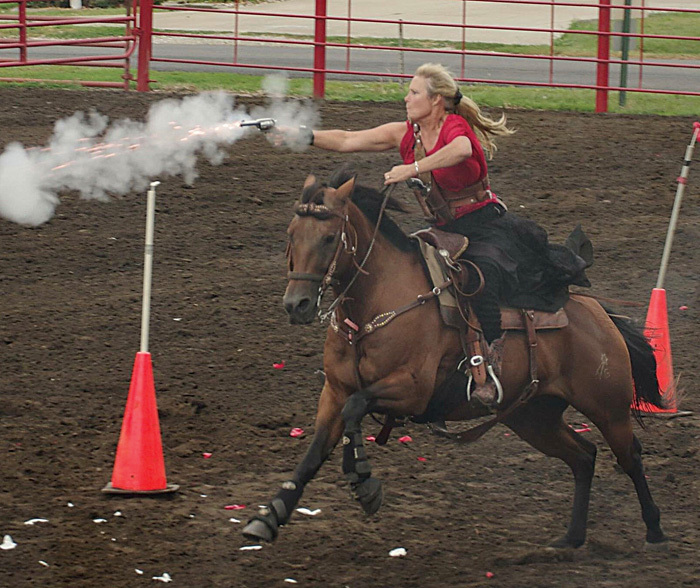 Maria Gregory (above) combines her love of horses, guns and competitive attitude while she competes during a cowboy mounted shooting competition. Everyone needs a hobby that they can dive into beyond their work life. During the day she is a nurse, but after hours and weekends are quite different for Maria Gregory. When you combine your love for horses, your admiration for guns, the thrill of athletic competition and your love for people, you create a winning combination. That winning combo for this rural Lynnville resident has kept her busy as she has risen through the ranks to achieve top honors in the equestrian sport of cowboy mounted shooting. Gregory got her husband Jon interested in horses, a love she has had since the age of three. Five years ago, Jon became interested in this sport of cowboy mounted shooting and began competing himself. Through his involvement, his wife became interested in the sport, but as an observer only. “He kept after me to get involved and I just wouldn’t. I came across a pair of chinks I liked,” remarked Gregory “so I told Jon if he would buy those for me, I would start competing.” Shortly after that promise, Gregory’s father, who had imparted his love and admiration for guns to her, died suddenly. Her dad’s philosophy in life was that if you said you would do something, you did it — and so she decided that she needed to follow through on her promise to Jon and start competing. Keeping her promise has not only been a very enjoyable and worthwhile commitment but she also honors the memory of her father each time she mounts up to compete. The Cowboy Mounted Shooting Association (CMSA), the governing body that oversees this sport, is celebrating their 25th year. This family-oriented competition is the fastest growing sport in the nation among the many equestrian sports. Contestants compete in this fast action event using two .45 caliber single action revolvers. Each revolver is loaded with five rounds of specifically prepared blank ammunition. Compared to the double action revolver that can be shot by merely pulling the trigger, the use of the single action makes the competition tough because the hammer has to be cocked each time before firing. There are various levels of competitors, ranging from novice to seasoned professional. In addition to the revolver competition, there are also rifle and shotgun competitions. All competitors must wear full western dress that is either the traditional western style or old-time style from the 1800s, use guns that resemble revolvers from the late 1800s, and ride a horse that has the temperament and training ability to take the rider through the paces of the tough events. In addition, the rider and the horse wear earplugs, to protect from the noise. Each event centers on the rider accumulating points by successfully running the course and not losing points for various deductions that can occur. “During my first year competing, I finished dead last at the world’s competition in Texas, but in my second year, I finished 10th overall,” reminisced Gregory. In her competing, she has risen to level three out of the six levels and is fast approaching the status of level four. “During that first year, I struggled to find the right horse, getting the right form in shooting and overcoming some injurie,s but the second year, things started clicking,” commented Gregory. This year will mark her fourth year in cowboy mounted shooting competition and she has one main goal when she enters each season — stay ahead of everyone. This sport is full of hard competitors ranging anywhere from the weekend novice up to professional riders and jockeys. There are more than 80 riding patterns and the competitor is not told which patterns will be used during a competition weekend until they check in for the event. Using their horse and guns, the rider needs to run the course, fire their guns at balloons strategically set throughout the competition arena and cross the finish line. The thrill of the competition is the speed and accuracy that the rider exhibits in shooting these strategically placed balloons, all within 10 and 25 seconds. “A good run of hitting all targets and the pattern successfully completed is what I call shooting clean — my number one goal each time,” stated Gregory. For the 2019 season that runs from January to October, there are 300 different competitions in 104 different locations, spanning 35 different states from coast to coast. Illinois has 15 competitions alone, including Springfield. Gregory has won her class in the Springfield competition for the last three years. In addition, there are four events held in Canada. The events range from small club-sponsored events with just a handful of competitors up to the majors which can feature anywhere from 250 to 400 riders. The bigger the shoot, the more opportunity for the competitor to accumulate more points. The competition season culminates in the World Championships, a four-day event held in Texas. In 2018, Gregory competed from mid-March to November every weekend except for three. “The furthest we have traveled is Texas,” remarked Jon, “but, we go to Missouri, Oklahoma, Wisconsin, Mississippi, Kentucky, Ohio and Iowa, just to highlight some of the other states.” “Most of the competitions are a weekend in length,” followed up Gregory, “but when I go to a majors event, I will be gone for a week at a time.” Last year she attended five out of seven events that were classified as majors. In 2018, Maria Gregory was also named Highpoint Cowgirl for the Sullivan, Missouri, club to which the Gregorys belong called the Missouri Big Irons. How has this hobby worked out for cowgirl Gregory? At the completion of the 2018 season, she was the reigning APHA Divisional Eastern National Champion, the National Incentive Divisional Champion, the AQHA Congress Class Champion, Mid-Central Regional Class Champion and the State Champion for both Missouri and Wisconsin. She is looking forward to what 2019 has in store.